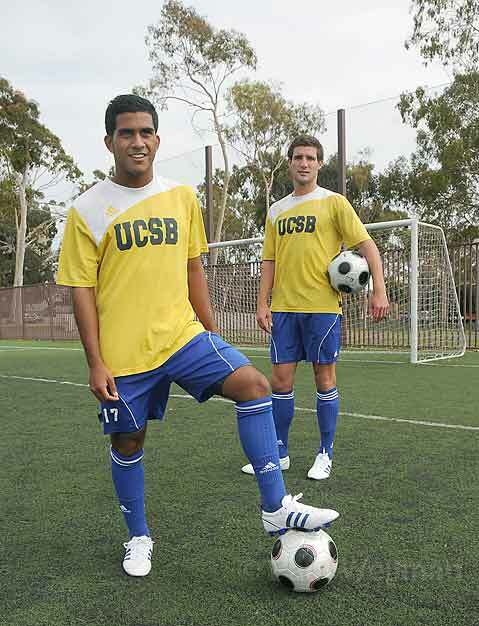 UCSB is counting on Bryan Dominguez (left) and Chris Pontius to score some goals for the men's soccer team, especially in upcoming matches against Evansville and Wake Forest. UCSB’s soccer team went east last week with a 3-0 record and a No. 6 national ranking and returned home feeling Gaucho blue after being upset by Rutgers (3-2) and Columbia (3-1). The Gaucho men are like a football team that keeps rolling into the red zone, only to stall out short of the goal line. They took 22 shots to Columbia’s seven. Their last home game, a 1-0 victory over Kentucky, should have been a scoring feast, but they put just one of 28 shots past the goalkeeper. A good time for the Gaucho men to start connecting would be now. Thursday, September 18, they host Evansville (5-0) at Harder Stadium, and on Sunday, top-ranked Wake Forest (also 5-0) arrives for a 6 p.m. showdown. Wake’s Demon Deacons won the NCAA championship last year, while the Gauchos knocked them off en route to the 2006 title. UCSB will then hit the road against two other former national champs, Indiana (Sept. 27) and UCLA (Oct. 1). The Gauchos’ defense took a hit from the graduation of All-American Andy Iro and Greg Curry last year, and their most experienced returnee, senior Kyle Kaveny, went out with a broken leg in the preseason. Vom Steeg is awaiting a decision from the NCAA whether another brilliant offensive player, Michael David of Nigeria by way of Gig Harbor, Washington, will be eligible this season. Meanwhile, after a 2-1 victory over Tennessee last Sunday, the Gaucho women’s soccer team is off to a 5-2 start. SBCC’s men have been scoring like crazy: 13 goals in their last two games. They’ll host Rio Hondo on Friday night. 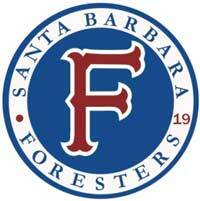 PITCHING TO RANDY MOSS: The Santa Barbara Foresters like to boast that 21 ballplayers have made it to major leagues from their semipro team. They also have a guy in the NFL: New England Patriots quarterback Matt Cassel, who won his first start since high school last Sunday, had a cup of coffee with the Foresters as a pitcher in 2004. At USC, Cassel played behind two Heisman Trophy QBs, Carson Palmer and Matt Leinart. To keep up his competitive fervor, he played on special teams, saw action as a receiver and tight end, and did some pitching for the Trojans. The Foresters were his last baseball team before the Patriots took him in the seventh round of the 2005 NFL draft. ATHLETES OF THE WEEK: The tradition of singling out a regional male and female Athlete of the Week continues at the Santa Barbara Athletic Round Table luncheons every Monday during the school year at Harry’s Plaza Cafe. UCSB soccer players David Walker and Jacqui Simon were recognized in Week One. This week’s honorees are San Marcos High linebacker Adrian Stimson, a leader of the defense as the Royals scored their first football victory in two years (10-8 over Rio Mesa), and Dos Pueblos High tennis standout Erica Cano. For more sports, including a weekly highlight schedule, see independent.com/sports. College men’s soccer Evansville at UCSB, Harder Stadium, 7 p.m.
High school girls volleyball Oxnard at Santa Barbara, 6:30 p.m.; Laguna Blanca at Carpinteria, 5 p.m.
High school girls tennis Mira Costa at Santa Barbara, 3 p.m.
High school football Lompoc at San Marcos, 7 p.m.; Santa Barbara at Beverly Hills, 7 p.m.; Dos Pueblos at Cabrillo, Lompoc, 7:30 p.m.; Bishop Diego at Fillmore, 7:30 p.m.; Carpinteria at Nipomo, 7:30 p.m.
College women’s soccer Mt. SAC at SBCC, La Playa Stadium, 2 p.m.
College men’s soccer Rio Hondo at SBCC, La Playa Stadium, 7:30 p.m.
College women’s volleyball UCSB at Pepperdine, 7 p.m.
High school girls volleyball Littlerock at Carpinteria, 4 p.m.
College and open cross-country Westmont Invitational, 9:30 a.m.
College women’s volleyball UCSB vs. Texas State at Pepperdine, 1 p.m.; Fresno Pacific at Westmont, 3 p.m.; SBCC Quad Tournament, 12 p.m.
High school football (eight man) Valley Christian-Santa Maria at Laguna Blanca, 1 p.m.; Cate at Avalon, 1 p.m.
College women’s soccer UC Santa Cruz at Westmont, 4 p.m.
College football SBCC at Ventura, 7 p.m.
Running Goleta Education Foundation Four-Miler, 401 N. Fairview Ave., 8:30 a.m.
College men’s soccer Wake Forest at UCSB, Harder Stadium, 6 p.m.
Santa Barbara Athletic Round Table press luncheon, Harry’s Plaza Cafe, 12 p.m.
College women’s volleyball Glendale at SBCC, 6 p.m.
College men’s soccer CSU San Marcos at Westmont, 2 p.m.
College women’s soccer CSU San Marcos at Westmont, 4 p.m.
High school cross-country Channel League meet at Dos Pueblos, 4 p.m.
High school girls golf Buena at Dos Pueblos, Glen Annie GC, 3 p.m.
High school girls volleyball Buena at San Marcos, 4 p.m.
Beach volleyball U.S. Open of Beach Volleyball, East Beach, 9 a.m.
High school football Lompoc at Dos Pueblos, 7 p.m.; San Marcos at Oxnard Hueneme, 7 p.m.; Santa Barbara at Santa Maria Righetti, 7:30 p.m.; Santa Paula at Bishop Diego, La Playa Stadium, 7:30 p.m.; Grace Brethren at Carpinteria, 7:30 p.m.
College men’s soccer Vanguard at Westmont, 1 p.m.; UCSB at Indiana, 4:30 p.m. PDT. College women’s soccer Vanguard at Westmont, 3 p.m.
High school football (eight man) High Desert Academy at Cate, 2:30 p.m.
College football Antelope Valley at SBCC, La Playa Stadium, 6 p.m.
Swim-bike-run Carpinteria Triathlon, Carpinteria State Beach, 7:30 a.m.